The war that never happened! The Syrian civil war has been ongoing for over 2.5 years, with no clear end to the conflict. On August 30, 2013, the Secretary of State John Kerry made the case for military action in Syria. People just didn't buy it, not in England, not in the United States. President Barack Obama was spared a major domestic and global disaster, mainly thanks to the Russians, who proposed an outline and a timeline to get rid of Syrian Chemical Weapons. On October 14, 2013 Syria entered the Chemical Weapons Convention. The reason for intervention? "Humanitarian" action against chemical weapons use by the Syrian Government. The evidence? videos of the dead and the dying. More evidence? "Some things we do know, we can't talk about publicly" according to John Kerry. Evidence was weak, and primary argument was based on capability; "only the Assad forces have capability". But on a closer look, there had been reports of the opposition forces using chemical weapons, and even being caught with chemical weapons in Turkey. Anyway, thankfully no bombs have been dropped - so far. 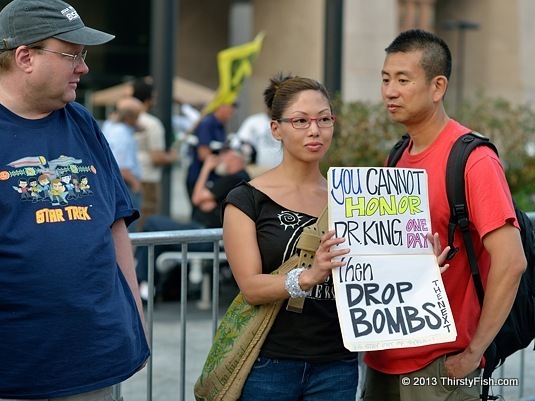 So how does one honor Dr. King one day, and drop bombs the next? President Eisenhower had the answer: "We must guard against the acquisition of unwarranted influence, whether sought or unsought, by the military-industrial complex". Got to love the Trekkie. Update 2013-12-09: It's reassuring to know you're not crazy. Finally, the "capability argument" is also challenged by the Pulitzer Prize-winning investigative journalist Seymour Hersh: Obama "Cherry-Picked" Intelligence on Syrian Chemical Attack to Justify U.S. Strike by failing to disclose it knew Syrian rebels in the al-Nusra Front had the ability to produce chemical weapons, and more.